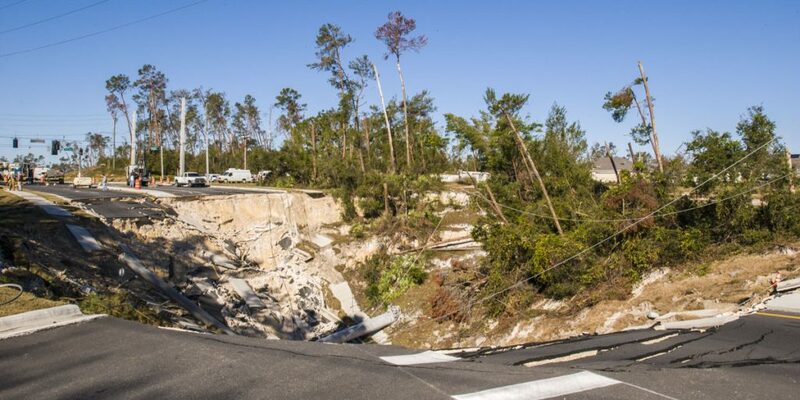 Sinkholes are part of the slow, natural process of erosion in Florida’s limestone terrain that occur over thousands of years. These common geologic phenomena generally occur where the limestone is within a few hundred feet of the land’s surface. Though most are only 10 to 12 feet in diameter, sinkholes have been known to expand to hundreds of feet in diameter. Many of central and north Florida’s lakes actually are the result of old sinkholes. Rainfall percolating, or seeping, through the soil absorbs carbon dioxide and reacts with decaying vegetation, creating a slightly acidic water. That water moves through spaces and cracks underground, slowly dissolving limestone and creating a network of cavities and voids. As the limestone dissolves, pores and cracks are enlarged and carry even more acidic water. Sinkholes are formed when the land surface above collapses or sinks into the cavities or when surface material is carried downward into the voids. Drought, along with resulting high groundwater withdrawals, can make conditions favorable for sinkholes to form. Also, heavy rains after droughts often cause enough pressure on the ground to create sinkholes. In urban or suburban areas, sinkholes are hazardous because they can destroy highways and buildings. Sinkholes also can cause water quality problems. During a collapse, surface waters may leak into the aquifer, our underground source of drinking water. Many natural sinkholes cannot be prevented. However, those caused by human activity may be avoided, especially those caused by over-pumping groundwater. 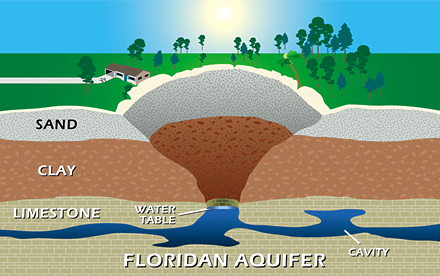 During dry conditions, water tables drop in the limestone and cavities under Florida’s sand and clay soil. The combination of gravity, loss of buoyancy and water pressure can activate a collapse. By keeping water tables high, water conservation rules and drought restrictions are tools to help prevent sinkholes from occurring. The St. Johns River Water Management District promotes year-round water conservation and issues watering restrictions to prevent water shortages and over-pumping during Florida’s inevitable times of drought. The district is responsible for providing long-term protection of the water supply. While water restrictions can cause some inconvenience to residents and businesses, limiting outdoor watering is critical throughout the year, and especially during a drought. Public cooperation is vital to ensuring long-term water resource protection. A rapid sinkhole caused by well drilling or other sudden alterations to the terrain may not give any warning signs. Otherwise, the collapse process usually occurs gradually enough that a person may leave the affected area safely. The final breakthrough can develop over a period of a few minutes to a few hours. There are many other causes of localized ground settlement and vegetation stress, and depressed areas are not necessarily indications of an imminent sinkhole.